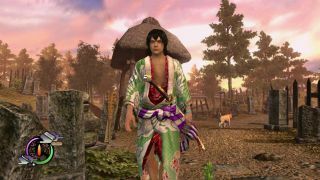 Acquire's bizarre open world action-adventure game Way of the Samurai 4 is coming to Steam next week. On July 23, to be exact. But what is Way of the Samurai 4? Maybe this trailer will explain. No, not really. Maybe, then, the trailer's description can offer more concrete details. "The Way of the Samurai series is widely renowned for allowing players to make far-reaching decisions that can radically alter the course of the story and this, the fourth entry in this thrilling series and previously exclusive to the PS3, is no exception! Now all the sword wielding action, adventure and drama of the Way of the Samurai series comes to PC for the very first time, continuing the series’ blend of customization, exploration, action gameplay and quirky humour." In fact, Way of the Samurai takes place in the port town of Amihama during the mid 19th Century. The story will let you align yourself with one of three factions: the pro-government forces, the nationalistic isolationists, or the British Navy. The reviews for the PS3 version suggest it's a bit of an acquired taste . Way of the Samurai 4 will cost $25, and will be available for 40% off between tomorrow—when its Steam listing unlocks—and release.